Lawyers around the world for Apple and Samsung are in mourning today, as the two tech companies announce that they have decided to lay down their litigation pens and work side by side in technological engineering harmony (or maybe not, given the history). The exception, of course, is the United States, where the two companies will continue to sue the pants off each other until the bitter end, whatever that may be. The legal battle has been raging in courtrooms around the world for years, with both sides coming down on the winning and losing side of the court's decision. 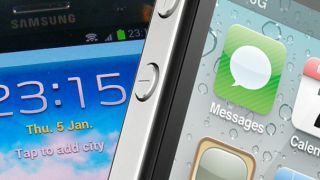 "Samsung and Apple have agreed to drop all litigation between the two companies outside the United States. This agreement does not involve any licensing arrangements, and the companies are continuing to pursue the existing cases in U.S. courts." It's exciting that the two behemoths have decided to end the never-ending cycle of suing and counter-suing, and will hopefully turn the money they save from ridiculous court costs towards some nice new innovation in their products. We would like to see an iWatch this year, after all. But if nothing else, at least we discovered these interesting corporate secrets during the process.